Special Features: Sneak peak at the fifth and final installment of the Cainsville Series, Rituals. Olivia, Gabriel and Ricky are beginning to farther embrace their fae counterparts; Matilda, Gwynn, Arawn. As they are becoming more and more like their former selves, feelings of the past are starting to Preston themselves in the current time frame. For all characters. But while some may have (finally!) acted on their actions, others hold great restrain and discipline. As they should, as not all feelings are full of light and love. The new fae to take centre fold: Lamiae. A snake-like fae that takes the illusion of young women and thrive on the warmth of others. But soon, the Lamie find themselves hunted. The Lamiae were fun, and interesting, however they were overshadow, for me, by Ricky’s growth with the Cwn Annwn. I wanted to know more about this mystery hound, and the connection that it shared with Ricky. Olivia seems to be embracing her new life with more stride, while Gabriel and Ricky are still trying to come to terms. Gabriel struggles to be the man that the Twyleth Teg envision him to be. While Ricky is embarking on a path he despritely trying to avoid, but somehow keeps getting pulled into. Ricky definitely became more interesting in this installment. But no matter how interesting he became, he’s no match for the flame that is burning (and only getting hotter) between Olivia and Gabriel. Olivia and Gabriel’s relationship is moving in a direction that will soon see the end of Ricky. But will Ricky be able to maintain his friendship with Olivia, even if she chooses Gabriel over him? If we’re placing bets or predictions, my bet is no. Ricky knows that he will not be able to withstand a nonromantic relationship with Olivia, and some major show down between the fae clans will end up with Ricky sacrificing himself for her. Which Olivia will be heartbroken over, but she’ll have Gabriel there to comfort her, so all will be fine. The case between and Paula and Todd is still open, but we see very little of them in Betrayals. It was a little disappointing, because I wanted to see more of Olivia and Todd’s relationship as daughter and father grow. My overall rating: 4/5 stars. Why a 4 and not a 5? I feel like Olivia and Gabriel’s relationship, or lack of one is still such a big tease. A will they, or won’t they situation. Olivia and Ricky’s relationship has barely any development until the end, and even then it still ended the same as the last book. I feel like a harder blow should have hit the three of them. Not even to cause a rift, because there is one, it just very small. But one large enough that you really felt the impact. With Rituals being the last book in the Cainsville series, without a doubt a huge hit will strike the trio, all I’m hoping is that I don’t have to wait until three quarters of the way through to see it. Would I recommend: Yes. A mystery thriller mixed with fae mythology, and murder. 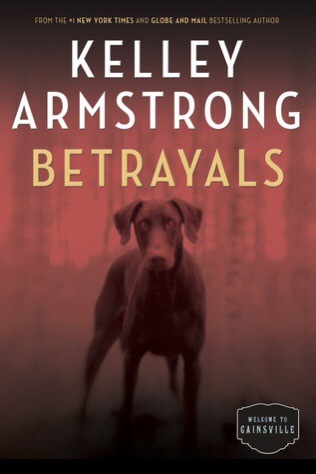 Betrayals will keep you on your toes and wanting to flip to the next page because you’ll be desprite for more.